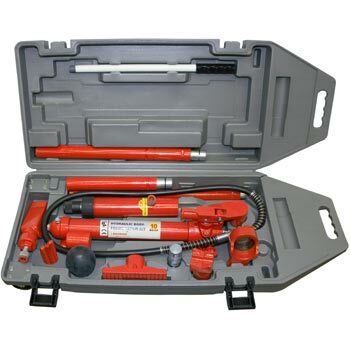 The JM-4010PW is a 17 piece Power Jack Kit that includes a heavy duty carrying case. This Power Jack Kit is perfect for automotive body & frame repair. There is also a lighter, 4 TON version of this product available, more info on the JM-4004P is here. The JM-4004P's weight is just under 88 LBS. If you have any questions regarding shipping procedures or would like more information on this equipment, PLEASE CALL US AT 1-888-736-5094!